SearchMe shows the results of a search in a rolodex format (using Adobe Flash). A photo of each page returned form the elements in the rolodex. There is a dragging bar using which you can flip through the rolodex. You can also use the mouse wheel or the arrow keys on your keyboard. Quite interesting to say the least. The rolodex display however has a disadvantage. A user can see only limited results on the screen at once. Worry not for SearchMe has a solution. Right below the dragbar is a small button clicking which the screen splits horizontally. On the top is the rolodex view and at the bottom is the more conventional search results in a list. These two views are connected. So if you use the rolodex at the top, the list at the bottom scrolls accordingly and vice versa. Nice feature. 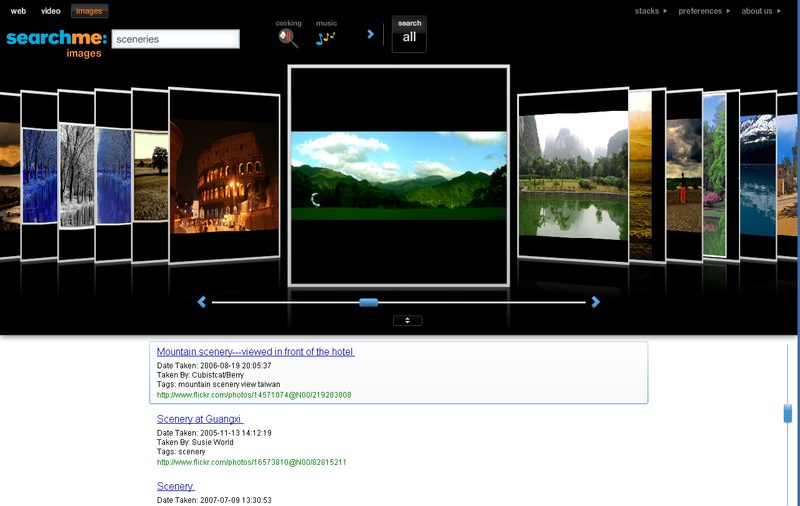 SearchMe introduces the concept of search stacks. A stack is basically a set of search results. So if you want to create a list of some of the result items, all you do is drag and drop them onto a new stack. Afterwards, you can browse through the stacks that you created. 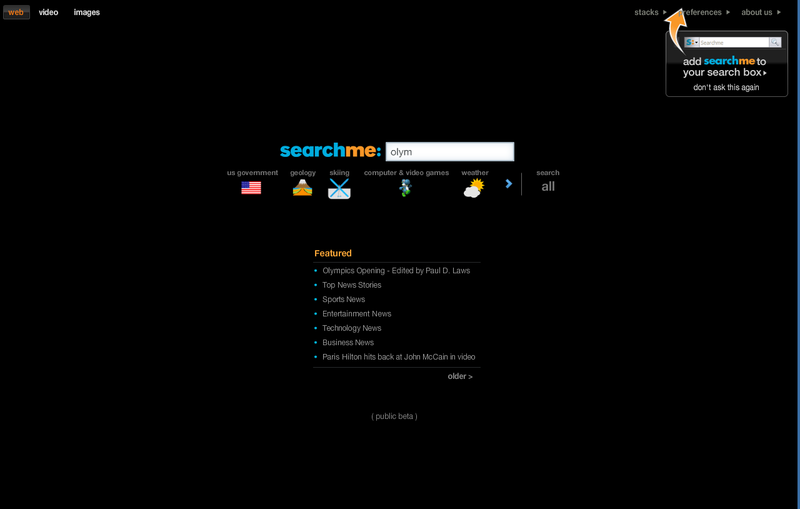 The home page of SearchMe is pretty spartan with a search box and list of some of the popular stacks. While typing in a search term SearchMe displays relevant categories in a horizontal list right below the search box. Quite useful. Here’s a video that gives you a demo of the search engine, but I suggest that you take a look at it for yourself at http://www.searchme.com. Now for the inevitable question: Do we need another search engine? Well people still think yes. And that is why we have had Google, Yahoo, MSN, etc. But like I said, if you are looking for relevance of the searches probably Google is still the best bet. 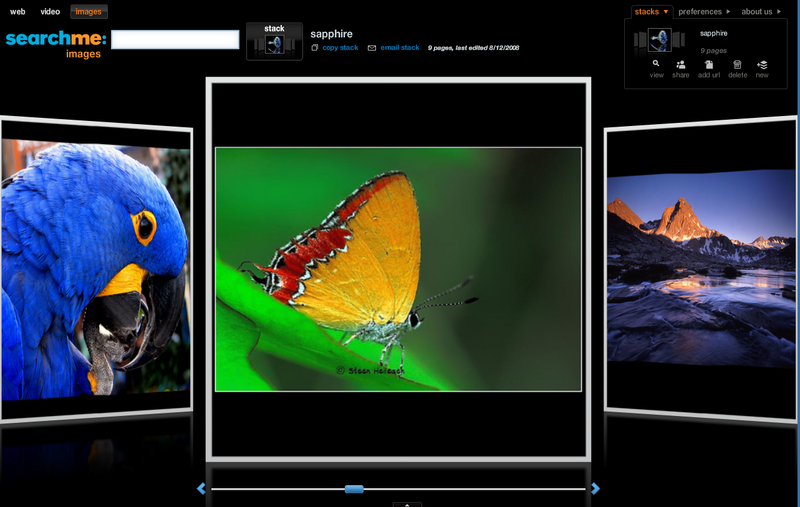 But if you are looking to make web searches fun and involving SearchMe does a great job.